Bryce Harper noticed it, too. For the record, Kapler and Harper have gotten along swimmingly since the latter signed a 13-year, $330 million contract on March 2. Kapler devised a schedule to get his new superstar ready for opening day in only about 3 1/2 weeks. Harper reciprocated by calling Kapler a "great manager" and admiring how he looks without a shirt. But the honeymoon is almost over. It's about to get real. And if the Phillies should happen to stumble out of the gate, well, nobody figures to face more heat than Kapler. "I love the challenge," Kapler said. "I love the fact that it's different to lead in the city of Philadelphia and the reason is because people are so passionate. I wouldn't want it any other way. The expectations for this team got bigger as we spent more time in first place last year, and the expectations are much bigger now." Indeed, after owner John Middleton committed nearly half a billion dollars for general manager Matt Klentak’s offseason roster overhaul, the stakes haven’t been this high since “The Four Aces” — Roy Halladay, Cliff Lee, Roy Oswalt, and Cole Hamels — took the ball in succession for the first four games of the 2011 season. The difference then, of course, was that the Phillies were three years removed from winning the World Series. They were in the midst of five consecutive division crowns, a run that earned manager Charlie Manuel the benefit of whatever doubt existed that they would keep winning. Kapler doesn’t enjoy that luxury. Never mind that, as a rookie manager last season, he steered a young, deeply flawed team into first place for 39 days by searching for every possible advantage. He shuffled the lineup 95 times, burned through 138 batting orders, and used a pinch hitter as early as the second inning. He deployed relievers based on matchups rather than roles. In the first week of the season, he mistakenly brought in a pitcher who hadn’t warmed up. He got booed during pregame introductions at the home opener. That's both ancient history and part of Kapler's story, a tale that took additional twists amid an offseason report of the questionable way that he handled a sordid incident involving two players when he was running the Dodgers' minor-league system in 2015 and recent allegations that several Phillies players were leaving the dugout during games last September to play Fortnite in the clubhouse. Gabe Kapler (middle) makes a pitching change during a Grapefruit League game. It was that last story, prompted by Carlos Santana's comments to ESPN last week, that painted Kapler in a negative light as it pertained to his performance as the Phillies' manager. And while several players disputed the accuracy of Santana's claim, they also circled the wagons, publicly and privately, against criticism that Kapler doesn’t have a firm hold over his players. "One thing that I want to make clear is that this has absolutely nothing to do with Kap," Rhys Hoskins said. "Kap is a great leader. He knows how to bring us together." Kapler, whose three-year contract runs through the 2020 season, is also a progressive thinker. He doesn’t set out to defy convention, but isn’t bound by it, either. He’s willing to change his mind. If something isn’t working, or if there’s a better way to accomplish a goal, he’s open to listening and adjusting. There's reason to take Kapler at his word when he says he will maintain a more static lineup this season. With as many as seven regulars who are accustomed to playing 150 games per season, there won't be nearly as much tinkering. But Kapler will still face challenging in-game pitching decisions. And he will have to keep everyone happy in a clubhouse filled with All-Stars and two former MVPs (Harper and Andrew McCutchen). Kapler’s relationship with Harper, in particular, is critical. 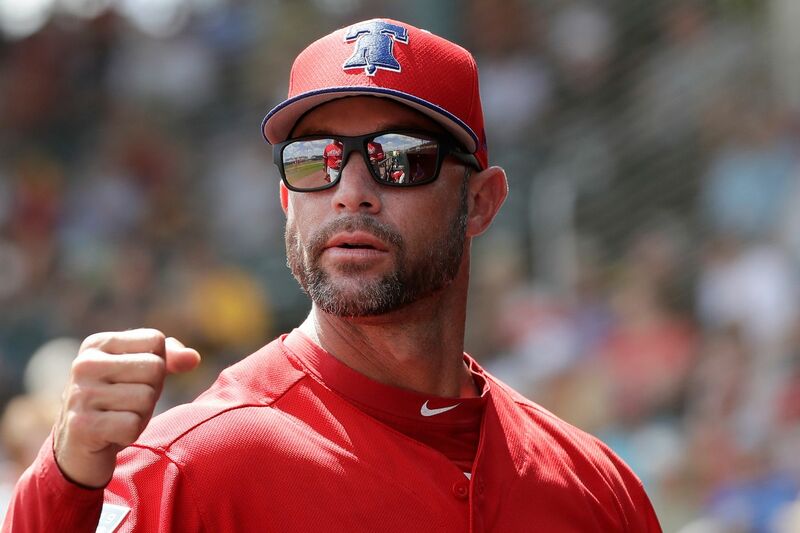 During an appearance this week on Extra Innings, Philly.com’s new Phillies podcast, Kapler said he began getting to know the new face of the franchise with a private meeting in an empty clubhouse in Clearwater a few days after Harper signed his contract. Harper, too, said he gained a deeper perspective on Kapler than what he had seen from across the field last season. The Harper era will begin for real at 3:05 p.m. Thursday at Citizens Bank Park. The Phillies have transitioned from rebuilding to contending. And they will hit the ground running. Twenty-one of their first 28 games will be against NL East opponents. It had better, especially for the sake of the manager who will be in charge of bringing it all together.